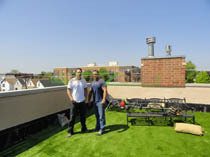 RugZoom Synthetic Grass & Landscaping? RugZoom is a full service artificial turf landscape and supply company utilizing both low-maintenance real and artificial turf products e.g. grass, trees, flowers, plants, shrubs and foliage. Sometimes referring to our artificial turf in Chicago as "grass rugs", we're stocked with plenty of them. RugZoom carries 16 different lines of synthetic grass from which you can select which best fits your functional and aesthetic preference as well as budget. By creating unique, custom and very low maintenance landscapes for urban residences, we cater to the busy homeowner. From sport fields to dog runs, single-family home front yards or back yards to concrete balconies of high-rise condos in the Loop, no project is too big or too small. Okay got it, but RugZoom? Well it's easy to remember. We also didn't want to name it "Great Grass, Inc." or something equally as vanilla since the industry is saturated with titles like that. Further we specialize in artificial turf installation in a wide variety of applications and compliment this by also building amazing decks, pergolas, arbors, gazebos, retaining walls, full landscape design & build. In addition to more conventional artificial turf applications, does RugZoom build Chicago artificial turf sport fields, Chicago soccer fields, artificial turf putting greens, and sell designer cupcakes out of one of those street vans in the city? Yes. Yes. Yes. & No. But we do deliver Christmas trees out of a van or two right after Thanksgiving through Christmas each year. Check us out at TreeSanta.com and enter rz13 in the promo box at checkout for a 10% discount. Yes. Call or email anytime to set something up. Consultations, estimates and designs are totally free, no obligation. What maintenance does synthetic grass & landscaping require? Synthetic grass & landscaping is virtually maintenance free in general, especially if you enlist us for your totally optional yearly cleaning and maintenance. This yearly professional service is recommended to thoroughly inspect your landscaping. 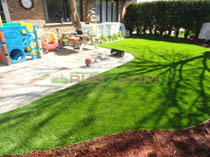 As it applies to artificial turf chicago, we check all the contact points, seams, drainage and any build outs completed. We re-apply any adhesive as needed, trim, re-fluff with a power broom and re-distribute infill if needed. All surfaces, plants, trees, flowers as well as all foliages are vacuumed, cleaned, rinsed, power washed and disinfected, then protected with a generous coat of our proprietary UV protector. This cleaning and preventative maintenance not only brings out the color of your artificial grass, etc but also refreshes the surface(s) and provides better fade protection for your landscaping. This service is entirely optional and will be discussed upon consultation. Our hard scape builds need even less maintenance typically, especially if we use composites. Does RugZoom provide ongoing cleaning and maintenance for their installations? 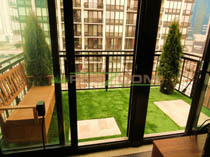 Why should you select RugZoom Synthetic Grass and Landscaping for your residence or commercial property? Simply put, our synthetic grass and landscaping saves you time and money as a homeowner or business owner while enhancing your properties appearance. Conditions for having real grass and landscaping all four seasons is not possible in this northern climate, nor is it even possible in Chicago in many instances over the spring/summer/fall. We provide Chicago synthetic turf to residents with green landscaping amenities previously unavailable due to restricted sunlight, high traffic areas, concrete areas, etc. RugZoom carry only synthetic grass from the finest US based manufacturers to secure the best, most technologically advanced artificial turf in Illinois and landscape supplies available. All of our products are custom manufactured to our exact specs from our suppliers. We're a local based original company (not a franchise), we do our own installations and we personally guarantee our work. All of our synthetic grass and hardscape landscaping in Chicago is of exceptional quality, is supremely durable and is a wise investment. It appears that I select my grass, trees, plants, etc. online. How does this work? It's very simple, scheduling a free in home estimate is the first step. After which we can go back to the e-route online if you prefer. It's tough to create firm quotes over the phone or email because these projects are very involved and price is determined based on many variables that are hard to predict, even after detailed conversation. We have a lot of tools to keep our cost as reasonable as possible and after a site visit we can assess what can and can't be used on your job. Be sure to ask about our "little monster" discount! We'll meet with you briefly, discuss your potential project, show you actual samples then leave you with a quote based on what you'd like to consider having done. If you wish to proceed, simply log onto this website, enter your quote number and specifically select (pick) what you'd like installed within your (Level 1 - 5 ) cost category per consultation. This is one route, simply calling works too! What are the benefits of synthetic grass & landscaping? First and foremost, it provides Chicago condo, town home, single family home and business owners the opportunity to have low maintenance grass, trees, plants, flowers, foliage and shrubs when having the living counterpart is not an option. 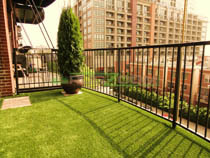 Whether you have a roof deck, balcony, terrace, patio, GREEN commercial entryway or conventional yard, RugZoom Synthetic Grass & Landscaping has the product and the look you want. Synthetic grass and landscaping can provide you with a beautiful outdoor living space without the hassle. 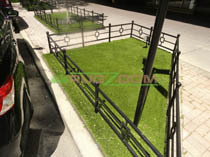 We carry the best versions of synthetic grass, trees, plants and flowers available on the world market today. Replacing real grass and landscaping saves money in the long run. Eliminating the need for watering, fertilizing, mowing, pruning saves time and money. Consider the benefits: no fading, no chemicals, no pet damage, no pests, no allergies and no muddy paw prints! Factor in the longevity of the products they last 15 - 20 years and need basically no maintenance once installed. Put simply, this cost-saving and time-saving artificial landscape design and installation opens beautiful new possibilities for city residences and businesses. 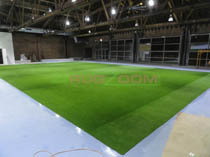 How real does RugZoom artificial turf look? Does it look and feel real? All of our synthetic grass, especially our Pro line looks and feels thicker, greener and more lush than real grass. We feel our products are of the highest grade available globally. Our premium grass will even "fluff" in the sun appearing more full when the sun is shining and help erase any wear patterns or footprints on its own. How long will synthetic grass & landscaping last? A very long time. We have an 8 year warranty on our artificial turf; however, under most conditions, this will last 20 + years. Our landscaping and any build outs we do are guaranteed to last for many years with minimal maintenance. Occasionally, but rarely, touch ups are in order. Since our products are fade resistant and very durable only an (optional) yearly maintenance plan is available to keep your landscaping looking sharp. 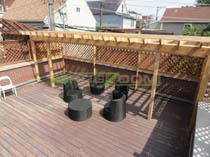 What about sunlight as it applies to Chicago artificial turf installation and deck/structure building? Sunlight tends to dull (grey) wood as the years go by if we don't use composite on any of our builds. Typically if cedar is used we recommend a light stain initial showing off the wood grain then after a few years when the wood grays a bit perhaps then look into a darkened, more saturated stain. Further, sunlight can take the sheen out of artificial turf over the first few years. This will make the synthetic grass appear less "shiny" which some people even prefer. It won't lose it's color though, green stays green. Is synthetic grass pet (especially dog) friendly? RugZoom has proven to be the perfect solution for your yard if you have pets. Fluids (e.g. urine) drain through the synthetic grass or can be rinsed off with a hose. Droppings can be picked up easily and discarded. 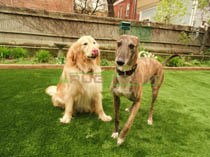 Dogs can't dig through our artificial turf Chicago lawns. Best of all, muddy paws coming into your house will be a thing of the past and letting your dog out after a bath will be a thing of the future! RugZoom provides pets with a safe, secure surface while at the same time eliminating unsightly dead spots. Destructive animals can not dig. Our artificial turf is made from a recycled polypropylene blend so it's very unlikely. Spillage should be hosed off to maintain a surface that does not attract dirt and bugs. Detergents and cleaners won't harm or discolor our artificial grass products. Even paint can be softened with paint thinner and then rinsed off without impacting RugZoom products. The engineering of the RugZoom artificial turf, coupled with the crushed rock aggregate sub-base creates a wonderful drainage system for your area. How well it drains is based on what kind of installation we're doing. We have a lot of different specific base preps depending on the application(s)...landscape turf, pet grass, sports fields, putting greens, etc. Each base prep is different and highly custom. 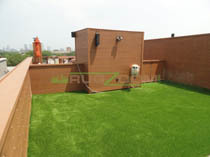 The backing on Rugzoom Chicago artificial grass products are permeable for drainage and at the same time, it is environmentally friendly. The backing also serves as a weed barrier. Below the crushed rock aggregate is the sub-base, which is the other key component of the synthetic grass drainage system. It facilitates the reception of substantial amounts of water during heavy rains. This depends on what you would like to accomplish and what your needs are. Many factors are considered to help us develop not just the best artificial turf in Chicago but also the appropriate installation method. For instance, building a putting green requires a totally different and specifically layered base than lets say, a dog area. Each property is unique so it's difficult to say exactly how much your project will run without taking a firsthand site visit. I've heard you have something called the "little monster" discount. What is that? That discount applies to the accessibility of your work space. We'll discuss this with you upon site visit and consultation. Everyone gets the "little monster" discount whether they ask about it our not so no worries if you're reading this after the fact (installation). How much does synthetic grass & landscaping cost? Since each project is a custom order an individual cost analysis is discussed at the consultation. Generally, costs are indicated per square foot and are itemized for our Level 1 - 4 trees, plants and flowers. Synthetic grass variables include the grade selected, the surface being covered, the amount of seaming, the patterns chosen, and the need to remove existing sod. Prices often range from $4 if you're buying only the grass to around $10 per square foot installed including the grass, tax, etc, all inclusive. In most concrete balcony settings in Chicago, the installation costs are lower. Replacing regular grass is substantially more labor intensive and therefore more costly. Check the cost comparison chart to compare the difference between our products and a regular grass lawn. We believe once you see how RugZoom Synthetic Grass & Landscaping saves you money and time, you will want to make this improvement in your property. Upon free consultation we will assess your project, determining how much synthetic grass you'll need as well as how much cutting and seaming will be needed. We'll bring plenty of samples when we meet so that you can see and touch the synthetic grass firsthand. I currently have real grass, but it doesn't grow well and I'm tired of the maintenance. What are my options? One option is to re-sod every year. This will run around $2 per sq/ft and it typically performs poorly if you have an existing issue with your grass. The issue with real grass, especially in the Chicago area is it getting it to grow in limited sunlight. If that can be achieved, it's the non-stop maintenance it needs. 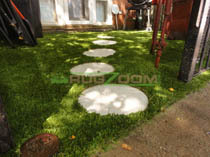 To switch over to RugZoom artificial turf Chicago, first we remove all the existing grass. We then replace with up to 4 inches (depending on the project) of a mixed base crushed rock aggregate (the base changes specifically depending on what type of installation we're doing), spread and flatten it with a plate compactor, spray it with a weed kill inhibitor, cover it with a weed block tarp, and only then proceed with the synthetic grass install complete with 2 pounds of infill per square foot. 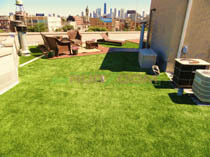 Once installed, RugZoom synthetic grass in Chicago will pay for itself over a matter of a few years. If you spend $200 per month on landscaping and water that equates to $2,400 a year not even including the re-sod prices. Over five years, your cost is $12,000 - $20,000 as an estimate. The average RugZoom synthetic grass lawn can be installed for much less, looks much better, is virtually maintenance free, and lasts several times longer. Think of it as an asset and an investment that can also increase the value of your property. How does synthetic grass affect my property value? 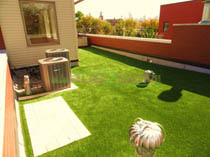 Is artificial turf installation in Chicago a good investment? Artificial turf is a very good investment possessing great residual value but like any good investment it takes time for savings to be realized. It also stays green and lush year round for years and years so it's something to be said also of the investment as it applies to the aesthetic enhancement as a benefit as well. Since there are no tangible savings associated with immediate but also long term aesthetic enhancement value add as well, it's usually not mentioned when the question of "savings" come up. Upfront cost(s) can be a little high for artificial turf installation in Chicago because of the labor intensive installation coupled with a high quality product. We do our best to keep our overhead low and cost(s) down while also bringing you what we feel is the best quality products. This applies to artificial turf in Chicago as well as Level 1 deck/pergola building and hard scape materials such as Treated, Cedar, Ipe or Composite build materials, etc. 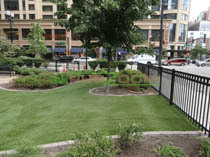 Most Chicago artificial turf installations take a few hours. However, a full single family home synthetic grass & landscaping project complete with deck builds, etc. might take a couple weeks. Each installation is customized so it is hard to determine the estimated length of installation without a site visit. How big or small of a job do you do? We do all sizes for a 10,000 sq/ft athletic field with drainage system to a 8x10' balcony remodel. No job is too large or small and we have no order minimums. We can provide you just the artificial turf or provide the complete artificial turf installation in Chicago complete with any hardscape build projects as well. RugZoom synthetic grass and landscaping saves lots of water and our artificial turf is made right here in the USA from recycled materials. 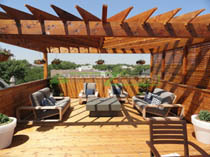 It also insulates your residence if used on a roof deck or any area with living space beneath. Grass and landscape maintenance in general requires mowing and a lawnmower requires petrol, a fossil fuel. Carbon emissions from the lawnmower will add to a growing problem. Chemicals used on lawns and most people who strive for the perfect, green lawn are inevitably going to use such as herbicides and pesticides are issues to be considered. Grass clippings as they break down, emit methane and carbon, two greenhouse gases that contribute to the global warming problem. Installing synthetic grass and landscaping cuts out these environmentally harmful. What about my kids playing on RugZoom Synthetic Grass? Kids will love their RugZoom artificial turf lawn and you will too! 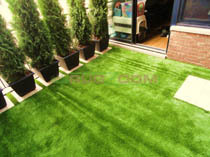 RugZoom is softer and safer than real grass and kids have loads of fun playing on it. Parents love the "no more stained pants and scraped knees". You may opt to purchase our padding to be installed below which further cushions the areas, providing critical fall ratings. 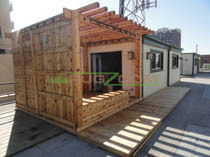 This makes our products popular for school yards, daycare centers as well as private homes. Rabbits will no longer dig holes in your lawn, gophers cannot come up through the turf, and bugs will not find a hospitable environment in our synthetic grass and your home will be free from the effects of using pesticides. What about home owner association (HOA) guidelines? We advise you to check with your association to see what the rules are. You may find that the association will want to make synthetic grass available uniformly throughout the building once they consider the benefits. When they consider the products are non-abrasive to the surface (in fact it protects it) and that they can be removed as needed, specific to each property, it may be mutually beneficial to upgrade the entire property. As this applies to our other hardscape builds such as decks, pergolas, etc., each residence is different. 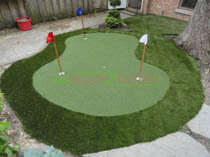 Those who enjoy the sport as well as the unique appearance we build custom decks (or use your existing wooden deck) and install our putting green synthetic grass overlay complete with one or many putting green holes, fringe, undulation pads, pull-up pole and flag. Putting greens are a highly layered and very detailed installation starting with the base prep all the way to surface infill fine tuned with a stimp meter for appropriate ball roll . 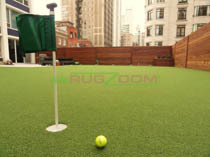 RugZoom artificial turf putting greens will be both functional and beautiful for years to come. Fore! What makes RugZoom Synthetic Grass and Landscaping different? We aren't a franchise and we don't subcontract out our artificial grass installations. We're a locally owned and operated artificial turf installation company that offers complete urban landscape design/build solutions. Check out our awesome decks, pergolas, arbors, gazebos, lighting, drainage systems, etc to further compliment our awesome putting greens, sport fields indoor or outdoor, landscape commercial and residential artificial turf projects. We have researched manufacturers worldwide, have visited, surveyed and interviewed most of our manufacturers firsthand. We have carefully evaluated their specs and studied their product samples and from across the globe, we believe we work with the absolute finest, most durable and state-of-the-art synthetic grass and landscaping products available from only the best USA based manufacturers. What is up with the electronic music you use with the soundtracks driving your website videos? Do you think that puts off the right vibe? Well it depends on whose listening. We highly recommend you turn up your speakers prior to watching any of the videos @ RugZoom.com. "Mute" is fine too though if you prefer! This is getting a little wordy, why am I still reading the FAQs? This is a tough one. In fact, we're not really sure you're even still with us at this point but if you are....make sure you check out the photos and videos here at RugZoom.com and also, visit our facebook page for more up-to-date, current running projects as they occur. Call or email any time with any specific questions too of course. We appreciate your interest.